This article specifies a simple REST-based service that booksellers can implement in order to provide Talis Aspire Reading Lists with information about items that they sell. Talis Aspire Reading Lists (TARL) is a resource (i.e. reading) list solution used by a significant proportion of UK Universities. See www.talis.com for our current customer base. TARL allows academics to collect resources from around the web including books, articles, journals, websites, podcasts, videos, etc. The academic then organises these into a list, which is published for students. The student can browse their list, and drill down on any resource to uncover more information, such as library availability and purchase options. These are provided through use of a bookseller widget, configured on a customer by customer basis. By default, this is set to Amazon but it can be configured using the specified API to work with local campus bookstores or other University endorsed booksellers to deliver local availability as well as online purchase choices. 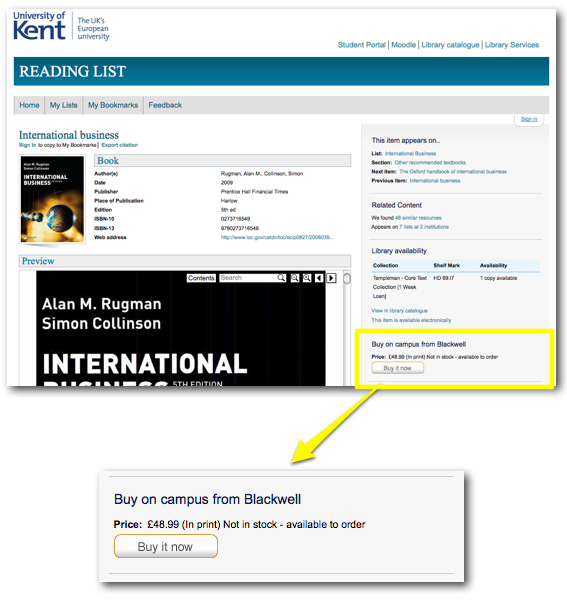 The figure below shows an example of the bookstore widget within Talis Aspire at University of Kent (in this case, for Blackwell). The bookseller is expected to implement this API so that Talis can easily query for bookseller availability and pricing information. The API is used whenever a student views an item detail page in their reading list. The API is not used to harvest data, and responses are not cached. The branchid parameter is optional and allows booksellers to provide results from one of their specific branches, for example the branch located on the Campus. A successful request for an item with an ISBN of “9781847879066”, that is also available in other formats would look like the example below. We know which item we originally requested details for, so we will make the assumption that any additionally defined items in the response exist because they are variations by format. It is worth noting the following for some elements in the XML response.